The New Hampshire People’s Platform is our proposal to move forward together on issues that affect all of us. Build a public mandate for a Medicare for All system which covers dental, hearing, eye care, mental health, and pre-existing conditions. Work to implement a humane harm-reduction approach to addressing the opioid crisis. Protect the gains made by the Affordable Care Act. Resist attempts to hijack our public education tax dollars & divert them to private & religious schools. Work to change our current property tax system of funding schools in favor of a more equitable school funding system. Push for debt-free higher education opportunities. We will work to create livable minimum wage that provides enough money for workers in New Hampshire to afford to live and provide for their basic needs. We will work to enact paid family and medical leave as a statewide public program to protect our working families during illness or the birth of a new child. Fight the development of new fossil fuel infrastructure and push greater investment in renewable energy. Work to empower our communities to move toward a 100 percent renewable energy economy, prioritizing opportunities for local energy ownership, good union jobs, and democratic participation as we transition away from fossil fuels. Sound good? Sign on in support of the People’s Platform. Gender Justice – Ensure equal treatment and nondiscrimination for all regardless of gender or sexual orientation. Protect women’s right to safe abortion services and healthcare access. Promote pay equity for women. Strengthen the protections won for the Transgender community in 2018. Racial Justice – Protect all individuals in our state from unfair racial profiling by police. Support the work led by communities of color to address structural racism inherent in local, state and national institutions within NH. 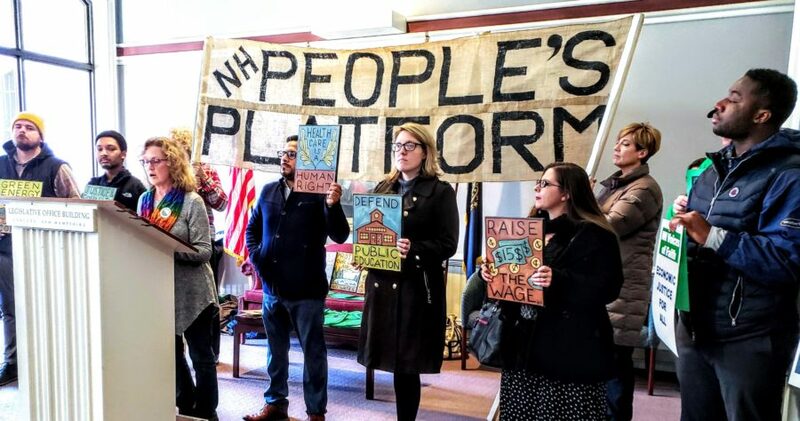 Clean & Fair Elections – Implement automatic voter registration and end the voting restrictions implemented by the NH Legislature under HB1264 and SB3. Create an independent redistricting commission for state elections. Military Spending – Divest from our nuclear and global military budget and reinvest in our local communities and a clean energy future. Fair Taxation – Shape our tax policy to solve our crisis around property taxes and make the wealthiest in our state pay their fair share in funding our public education, transportation, and other public programs. Criminal Justice – Support formerly incarcerated Granite Staters by banning the box requiring criminal conviction disclosure on initial job applications. Move toward treating drug use as a public health issue and not a law enforcement matter, starting with the legalization of cannabis. Immigration – Defend our immigrant neighbors from illegal searches, harassment, and deportation, at checkpoints and in our communities. Allow undocumented workers in NH to have drivers’ licenses. Transportation & Housing – Support increased funding for public transportation and the development of a commuter rail. Protect the rights of renters and make greater investments in affordable housing. Gun Violence – Enact common-sense gun violence prevention laws. Death Penalty – NH is the only state in New England that has not repealed this cruel, discriminatory and archaic practice; the time to abolish the death penalty is now.